Yesterday, I spooked some deer in my woods and saw their white tails flip as they ran. This reminded me of a favorite bird I have not been seeing recently. The Northern Flicker. An un-sighting can be as noteworthy as a sighting. What does a deer’s rump have to do with big tan woodpeckers that have black specks, yellow under their wings, and bluish heads with red spots? Like deer, Flickers flash white at you as they take off. There’s a big, bright patch on their lower back. I don’t know why it’s there. Girls have been highlighting their lower backs with tattoos for years. An attention-getting decoration. 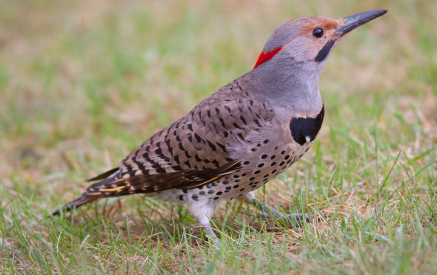 Maybe a Flicker’s white rump is also designed to grab attention. Who’s to say? But, more important: who’s to see? There are damn few Flickers around. Even the ornithologists call it a “decline.” I didn’t realize I hadn’t been seeing these birds until the deer’s white tails reminded me. Flickers are among my favorites. That they’re largely unseen these days is disturbing. If you made a film called “Unseen,” people would think it was a scary movie. The above post ran in May of 2012. Since then, it’s received a lot of comments, more than 100 at last count. One just recently came in, almost four years later. It’s good news that people are seeing Flickers, and when they Google them, they often wind up viewing this page. Thanks to everyone who commented, and told us that Flickers are alive and well. This entry was posted on Saturday, May 26th, 2012 at 10:19 pm	and is filed under "Daily Sightings" A Blog. You can follow any responses to this entry through the RSS 2.0 feed. You can leave a response, or trackback from your own site.